The content of this article provides interesting history, facts and information about Facts about Gladiators. Fact 18: The Praegenarii were the 'opening act gladiator'. This type of gladiator only used wooden swords, accompanied to festive music. Fact 20: Gladiatorial schools "Ludi Gladiatorium". The gladiator schools also served as barracks, or in some cases prisons, for gladiators between their fights. Fact 22: At the end of the day the gladiators who had been killed were dragged through the Porta Libitinensis (Gate of Death) to the Spoliarium where the body was stripped and the weapons and armor given to the dead gladiator’s lanista. 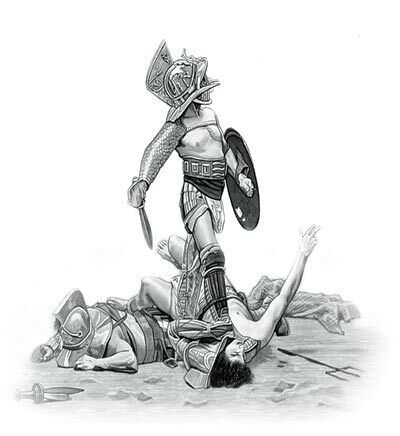 Fact 23: Prospective gladiators (novicius) had to swear an oath (sacramentum gladiatorium) and enter a legal agreement (auctoramentum) agreeing to submit to beating, burning, and death by the sword if they did not perform as required . Fact 24: Gladiators often had tattoos (stigma, from where the English word stigmatised derives) applied as an identifying mark on the face, legs and hands. Fact 25: Trained gladiators joined formal associations, called collegia, to ensure that they were provided with proper burials and that compensation was given to their families. Fact 28: One of the most famous gladiators was the Emperor Commodus (177-192 AD) who boasted that he was the victor of a thousand matches. The Roman Emperors Caligula, Titus, Hadrian , Cracalla, Geta and Didius Julianus were all said to have performed in the arena. Fact 30: The last known gladiator fight in the city of Rome occurred on January 1, 404 AD. The content of this Facts about Gladiators category on life in Ancient Rome provides free educational details, facts and information for reference and research for schools, colleges and homework. Refer to the Colosseum Sitemap for a comprehensive search on interesting different categories containing the history, facts and information about Ancient Rome. Just like the subject of Facts about Gladiators there is hardly a page of Roman history and the Romans that is not, on some way, connected to the Roman Colosseum which became a symbol of Rome, its society, culture and life.